To the south of Cairns is the highest freestanding natural pyramid in the world. You could be forgiven for thinking it is a tree covered man-made pyramid - the shape is almost perfect. But no, this is a natural phenomenon that is one of the most distinctive landmarks for the small sugar-farming town of Gordonvale. Walsh's Pyramid is used for hiking. The mountain is 922 metres tall, and quite steep so you need to be fit and healthy to make the climb. The Gympie Pyramid An ancient 'Terrace Hill' at least 6000 years old has been found on the outskirts of Gympie off Tin Can Bay Road. The Pyramidal structure is 100 foot high and consists of a series of terraces up to 4 feet tall and eight feet across constructed of small and larger lumps of stone. It was recorded by the first white man into the area in the 1850's. Constructed from granite blocks, it stands about 100 feet tall. A small idol was allegedly dug up around the same area that some say is a representation of the Egyptian god Thoth in ape form clutching the Tau or the Cross of Life. This statue is now on display in the Gympie Museum. According to Rex Gilroy, the man who discovered the pyramid and who runs the museum, it was created by Egyptians who had mining operations in Australia centuries ago, with bases of operation reaching as far as the Blue Mountains in New South Wales. Other objects have been purportedly found in the area including scarabs, coins and even an Easter Island type head. The ruins were taboo to them. Settlers took the stones of the pyramids and other buildings and used them as foundation stones for the main street of Gympie and the construction of buildings, including the local church, which still stands. There were stone statues like the Easter Island statues and also animal statues. These have since been destroyed or are hidden, but photos and sketches of them remain from the first white man to come into the area. Even the tunnels under Gympie were dynamited. All but one of the Pyramids was bulldozed into the ocean by the army in the 1950's and the lone survivor remains on private land with a strict "no trespassing policy. The Pyramid is 100 foot high and designed with a series of terraces up to 4 feet tall and eight feet wide. The army sealed the entrance in the 1930's after investigating reports of cattle wandering into the pyramid, when an opening was still accessible, and never coming out. No reports or findings are available. Altun-Ha means "stone water" - is located approximately 30 miles north of Belize City. 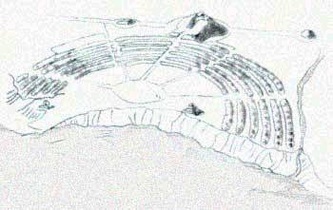 This ceremonial center, located six miles from the sea, was important as a trading center and as a link between the coast and the settlements of the interior. Within the central portion of the site there are more than 500 structures. 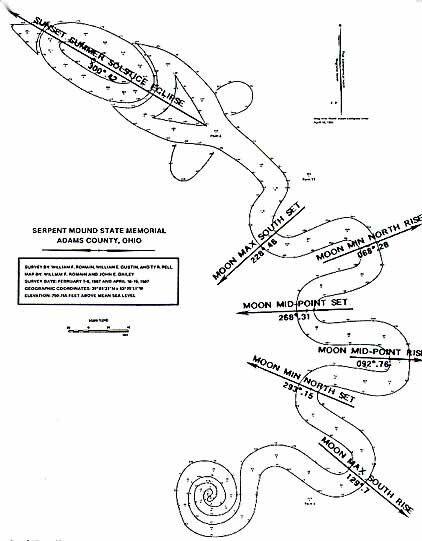 The entire city covered some 1.8 square miles and contains around 250 to 300 unexcavated mounds. Also, a treasure of over 300 jade objects was found there, including the ornately carved head of Kinisch Ahau, the Mayan Sun God. This head, weighing 9 3/4 pounds and measuring nearly 6 inches from the base of the crown, is believed to be the largest Maya jade carving in existence. Cuello is located on private property southwest of Orange Walk Town and most of it is still overgrown. Cuello is one of the oldest of all Maya sites, dating from 2600 BC. Bosnian pyramids refers to an area located around Visocica hill (or Grad hill), in the Bosnia and Herzegovina town of Visoko, northwest of Sarajevo , which became the focus of international attention in October 2005 following a news-media campaign promoting the false idea that it is actually the largest of a group of ancient man-made pyramids. Newspaper reports have quoted Osmanagic as claiming that they were constructed by ancient Illyrian inhabitants of the Balkans as early as 12,000 BC. The existence of pyramids in China has come in two stages. Most early stories were focused on the existence of "Great White Pyramid." A photograph of this pyramid in the Qinling mountains was taken by Americans in 1945, but remained in military files for 45 years. 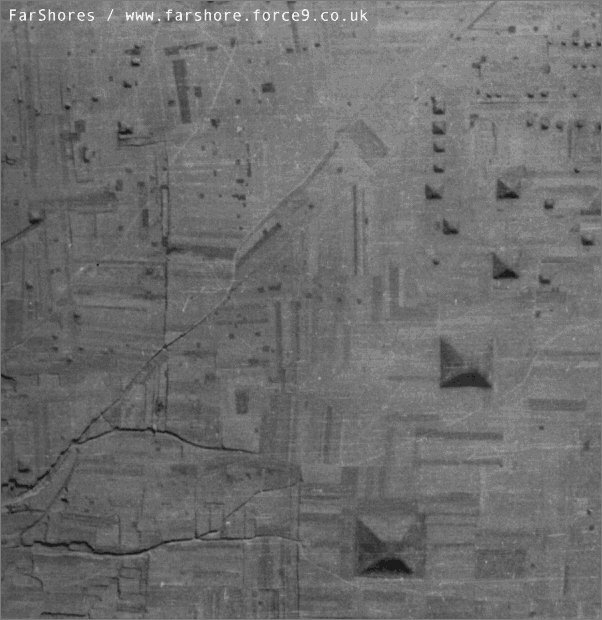 US Air Force pilot James Gaussman is said to have seen a white jewel-topped pyramid during a flight between India and China during World War II, but there is scant evidence for a source on this story. The Burma Tibetian Pyramid is called 'The Pyramid of Gathering'. 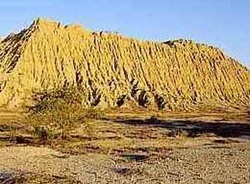 It is allegedly a bright white pyramid that is well preserved in the Buhtan Province. The limestone is still preserved beyond imagination. It supposedly glows under light. 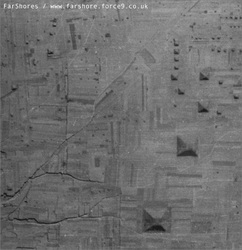 This pyramid was spotted by U.S. pilots in China in WWll flying over the hump in Burma. It is mentioned much by an Irish author Mona Rolf. It same size as the Great Pyramid in Egypt. Chinese archaeologists have discovered a group of ancient tombs shaped like pyramids, dating back at least 3,000 years, in Jiaohe City of northeast China's Jilin Province. The tombs, covering an area of 500,000 square meters (1,000 meters long and 500 meters wide), were found after water erosion exposed part of a mountain, revealing two of the tombs. Six smaller tombs had eroded away leaving no indications of their original scale and appearance, but the biggest tomb, located on the south side of the mountain, could clearly be discerned as a pyramid shape with three layers from bottom to top. A stone coffin, surrounded by four screen boards and covered by a granite top, was placed on the top platform. The coffin appeared to belong to the king of an early tribe based on the dimensions of the site, according to experts with the Jiaohe Archaeological Research Institute. The tombs are part of the Xituanshan cultural ruins site, which dates back 3,000 years to China's Bronze Age period. The ruins were excavated in Jilin in 1950. A lot of ancient hunting and domestic tools, including a stone knife and axe, as well as bronzeware and earthenware, have been unearthed from the stone coffin and other six smaller graves. The discovery will provide valuable clues on study of ancient funeral customs and the tomb structure and culture of ethnic groups in the area. A three-story pyramid dating 5000 years back has been discovered in north China's Inner Mongolia Autonomous Region. The pyramid, which looks like a trapezoidal hill from afar, is located on a hill one kilometer north of Sijiazi Town, Aohan County. The pyramid is about 30 meters long and 15 meters wide at its base. This is considered the best-preserved pyramid built during the Hongshan Culture period that has been found so far, said Guo Dasun, an archaeologist in charge of the excavation. This step pyramid, 31.58 by 31.58 meters square and 12.4 meters high, is located at Ziban, now in China. It fronts on the KukNae castle (Ziban) to the soth west, and 12 stone plates, the largest one of them measures 2.7m long and 4.5m high, leaned against the first step. There was four guardian stones, looks like a dolmen on the step, but survived just one which you can see below. It is called ‘Paechong’, means guardian tomb in korean. What a strange post looks like a sphinx in Egypt. 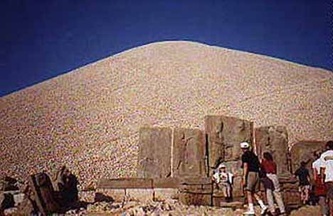 By the beginning of the First Dynasty, if not earlier, the mound of sand and rubble heaped on top of a grave, perhaps initially as a marker, had become associated with the primordial mound of creation. Out in the desert at Abydos, the first kings of Egypt were buried in deep brick-lined tombs topped with square or rectangular mounds of sand which Egyptologists call 'mastabas', due to their resemblance to the benches that once stood in front of modern Egyptian village homes. So important was the mound over these royal tombs, that by the middle of the First Dynasty, the builders constructed two of them. San Andrés is a pre-Hispanic site of El Salvador, whose occupation began around the year 900 BC as an agricultural town in the valley of Zapotitán in the department of La Libertad. This early establishment was vacated by the year 250 because of the enormous eruption of the caldera of Lago Ilopango, and was occupied again in the 5th Century, along with many other sites in the valley of Zapotitán. Between 600 and 900 AD, San Andrés was the capital of a Mayan lordship with supremacy over the other establishments of Valle de Zapotitán. Tazumal is a Pre-Columbian Maya archeological site in Chalchuapa, El Salvador. Tazumal means, "the place where the victims were burned," in K'iche'. The site is located in the heart of Chalchuapa in the department of Santa Ana, some 60 kilometers from the capital, San Salvador. Chalchuapa is a site which shows evidence of being influenced by Copán in Honduras, and also shares some stylistic elements that are more characteristic of central Mexican sites, such as Teotihuacan and the "Toltec"-style architecture at Tula.Tazumal includes a series of Maya ruins, including ceremonial architecture, that date to about AD 100-1200. The site includes an intricate water drainage system, a few tombs, adjacent minor pyramids, palaces and excavated ritual objects. 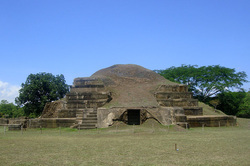 Cara Sucia is a Mesoamerican archaeological site in western El Salvador. The site was first settled in the Preclassic period and was finally abandoned around AD 900, in the Terminal Classic, when the Pipil people moved into the region, although there is no evidence of Pipil occupation at the site. It is thought that during the Early Preclassic (1200–500 BC), the site was occupied by people who spoke a forerunner of the Mayan languages, and during the Late Preclassic period the site has evidence of contact with Chalchuapa and with Kaminaljuyu in the Guatemalan Highlands. Joya de Cerén (Jewel of Cerén in the Spanish language) is an archaeological site in La Libertad Department, El Salvador featuring a pre-Columbian Maya farming village preserved remarkably intact under layers of volcanic ash. It is often referred to as the "Pompeii of the Americas" in comparison to the famous Ancient Roman ruins. Around the year 590,Loma Caldera, another nearby volcano, erupted and buried the village under 14 layers of ash. Tikal Temple I rises 47 metres (154 ft) high. Tikal (or Tik’al according to the modern Mayan orthography) is one of the largest archaeological sites and urban centres of the pre-Columbian Maya civilization. It is located in the archaeological region of the Petén Basin in what is now northern Guatemala. Situated in the department of El Petén, the site is part of Guatemala's Tikal National Park and in 1979 it was declared a UNESCO World Heritage Site. Tikal was the capital of a conquest state that became one of the most powerful kingdoms of the ancient Maya.Though monumental architecture at the site dates back as far as the 4th century BC, Tikal reached its apogee during the Classic Period, ca. 200 to 900 AD. The name Teōtīhuacān was given by the Nahuatl-speaking Aztec centuries after the fall of the city. The term has been glossed as "birthplace of the gods", reflecting Nahua creation myths that were said to occur in Teotihuacan. Nahuatl scholar Thelma D. Sullivan interprets the name as "place of those who have the road of the gods. "The original name of the city is unknown, but it appears in hieroglyphic texts from the Maya region as puh, or "Place of Reeds". In the Jungles of Brazil close to the Peruvian Andes Mountains lay twelve Pyramids in two rows of six side by side. 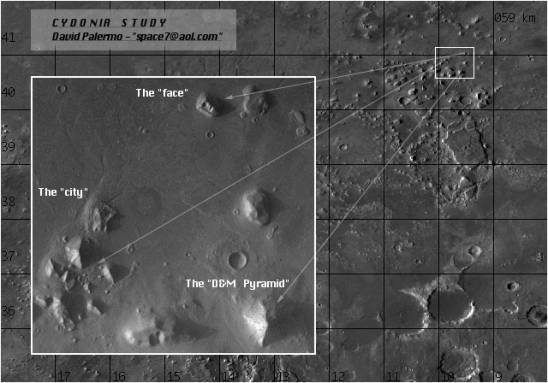 The site has been viewed on a satellite imaging map done by x-ray the jungle with infrared photography. Apparently lowering people on ropes from helicopters with chains saws the jungle resisted all attempts to get through the dense forest. Cochasquí Pyramid Site, Ecuador: Elevation; 12,000 feet. It was first disclosed to the world by Pino Turolla in Beyond the Andes. The pyramid is made out of cut stone construction. It is not far from the equator. 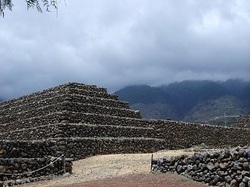 Akapana, also referred to as Aka/Ana, is a large mound that once was part of a set of twin pyramids with Puna Punka. It is roughly rectangular in shape with an oval central depression thought to have functioned to hold water. A stone built drain runs from the water holder through the mound to the south. 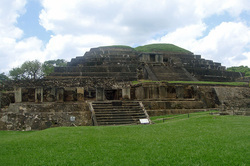 The mound was enclosed in a stone retaining wall of stepped plan, and is thought have had a stepped pyramid profile, not unlike the Mayan pyramids of Mexico. When the Spanish came to Bolivia they dismantled the stone structure of Akapana, and used the masonry to build the cathedral at the nearby town of Tiwanaku. While standing on the top of Akapana one can look across the altiplano and see the cathedral steeples looming in the horizon, a reminder of the forgotten Tiwanaku civilization. The Falicon pyramid is a monument located at a rural site near the town of Falicon, on the French Riviera, near Nice. It is constructed above a karstic cave known as the Cave of the Bats (Occitan: Bauma des Ratapignata) and is one of the few pyramids in Europe. The pyramid is constructed of small irregularly-shaped stones, possesses a fairly acute angle of inclination, and is in a partly ruined condition. While most of its upper section is missing, the lower section is reasonably well-preserved. The pyramid's purpose and origins are unknown, although it has been suggested that it may have been constructed by Roman legionaries involved in Egyptian cult practices. But more recent research has shown that the pyramid has actually been built between 1803 and 1812. There are more than 16 pyramids spread over Greece. 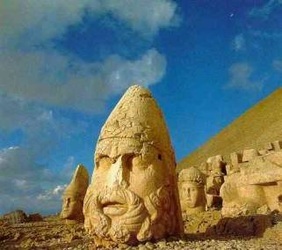 The oldest one is the Pyramid of Hellinikon. 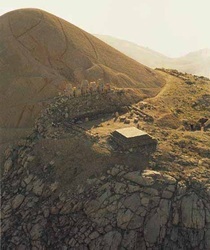 At the South-eastern edge of the plain of Argolid, near the springs of the Erasinos river (nowadays 'Kephalari') and on the main arterial road which in antiquity lead from Argos to Tegea and the rest of Arcadia and Kynouria, there is a small structure at present known as the Pyramid of Hellenikon. Not a lot is known about this site, except that it has the only pyramidal temple in Southeast Asia, and dates to 1416 - 1459 AD. It bears an uncanny resemblance to the Mayan pyramids. There is also a twin-headed serpent which may represent Quetzalcoatl. The Pyramid of Cestius (in Italian, Piramide di Caio Cestio or Piramide Cestia) is an Egyptian-style pyramid in Rome, Italy near the Porta San Paolo and the Protestant Cemetery. The pyramid is a funerary monument built about 12 BC as a tomb for Caius Cestius, a member of one of the four great religious corporations at Rome, the Septemviri epulonum. It is of brick-faced concrete covered with slabs of white marble, 27 meters high and about 22 meters square, standing on a travertine foundation. In the interior is the burial chamber, 5.95 metres long, 4.10 wide and 4.80 high. On the east and west sides, about halfway up, is the inscription recording the names and titles of Cestius, and below, on the east side only, another which relates the circumstances of the erection of the monument (CIL vi.1374). Machu Picchu (Quechua: Machu Picchu, "Old mountain") is a pre-Columbian Inca site located 2,400 meters (7,875 ft) above sea level. It is situated on a mountain ridge above the Urubamba Valley in Peru, which is 80 km (50 mi) northwest of Cusco. Often referred to as "The Lost City of the Incas", Machu Picchu is probably the most familiar symbol of the Inca Empire. Taking a Machu Picchu tour is a fascinating way to learn about Inca history, but this 360-degree virtual tour of Machu Picchu also illustrates the site's distinctive architecture. The Pulemelei mound or the Star Pyramid on the island of Savai'i (part of Samoa) is the largest and most ancient structure in Polynesia. The pyramid was built in the shape of a five pointed star. 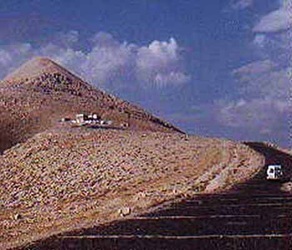 This large pyramid measures 61 metres by 50 metres at the base and rises in two tiers to a height of more than 12 metres.? It is almost squarely oriented with the compass directions?.? 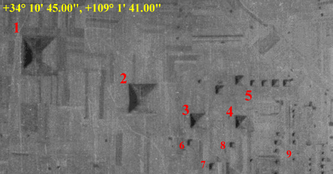 Smaller mounds and platforms are found in four directions away from the main structure.? 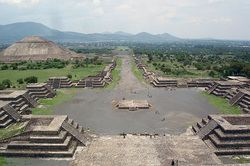 There is a relatively large platform about 40 metres north of the main pyramid and connected to it by a stone walkway. Unfortunately the jungle there is almost uncontrollable. 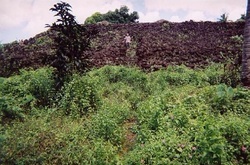 The pyramid has been cleared on several occasions, but the mound tends to get overgrown.? It is a pyramid constructed of natural basalt stones and at its base measures 65m x 60m and has a height of about 12m. Excavations have revealed that it was probably constructed sometime between 1100-1400 AD and was no longer used by 1700-1800 AD. It is almost squarely oriented with the compass directions. 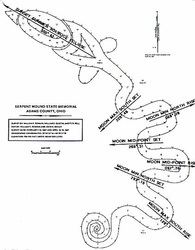 Smaller mounds and platforms are found in four directions away from the main structure. There is a relatively large platform about 40 metres north of the main pyramid and connected to it by a stone walkway. Unfortunately the jungle there is almost uncontrollable. The pyramid has been cleared on several occasions, but tends to get overgrown quickly once again. Six step pyramids were discovered in 1998 near Guimar, a town on the eastern shore of Tenerife Island, the Canary Islands. They are still a mystery to archaeologists. The term covers six step pyramids with a rectangular ground plan reaching a maximum height of about 12 metres. They have a noticeable similarity to the pyramids built by the Maya and Aztecs in Mexico. They are rubble-filled with facings of black volcanic stone and are the result of multiple episodes of construction. Andong step pyramid, is the best one of pyramids survived being undestroyed in South Korea, is located at soktapri, andong, korea, in the northern valley of Mt. Hakka, 30 km road away from Andong. 13.2 meters by 12.7 meters square and about 4.5 meters high. 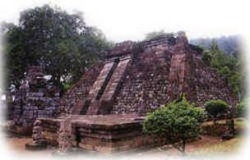 Small buddhist temple 'Soktapsa' is located at the north-east corner of pyramid, which is probably laid the foundation at the moment pyramid built. Strangely enough, small pyramid in seoul and 'soktapsa' at here had built at the corner of another big pyramid, not in a straight line. This plan of site is differant from the typical planning of buddhist temple and pagoda in korea at that times. Because of it, this stone pyramid is not a buddhist pagoda. 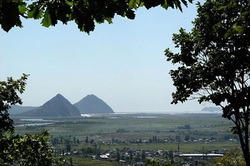 The suspected pyramids are located in the vicinity of Nakhodka, which became the primary deep water port in the Russian Far East when Vladivostok was closed off to foreigners between 1950 and 1991. Near the mouth of the Partizanskaya river, two hills display a pyramidal form. They are named Sestra (Sister) and Brat (Brother). The number of pyramids in ancient Nubia (aka Kush & today Sudan) were a total of 223, (Kerma, Napata, Nuri, Naga, and Meroe), Piankhi, Shabaka, Shabataka, Tanutamun, double the pyramids of its neighbor Egypt. The underground graves of the Nubian pyramids were richly decorated. All pyramids were not monuments of kings is evinced by their great number. Other grandees of the empire, especially priests of high rank, or such as had obtained the sacerdotal dignity, might have found in them their final resting place. The well-known British writer Basil Davidson described Meroe as one of the largest archeological sites in the world. Mt Nemrut, Kahta is a natural mountain (2150m), with a 50 metre artificial peak built on top. 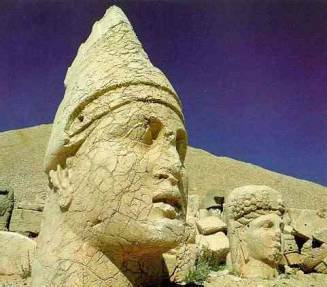 It was constructed as a tomb for King Antinochus I during the period 80 B.C-72 B.C. If pyramids are meant to represent mountains, the builders of this one have gone a step further by placing it on top of a real mountain. 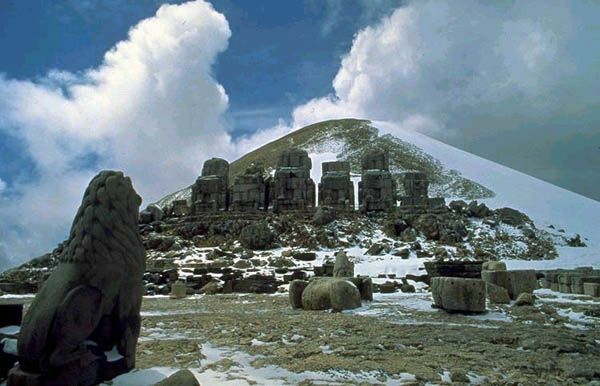 Not just an artificial mound, this site features huge (10 metre high) statues. 3 km long and 1.5 km across and lies some 10 degrees North of the Martian equator. It was first photographed on July 25, 1976 by the Viking 1 space probe orbiting the planet at the time. 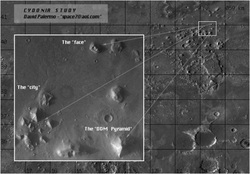 It was brought to the attention of the public in a NASA press release of the photo six days later.